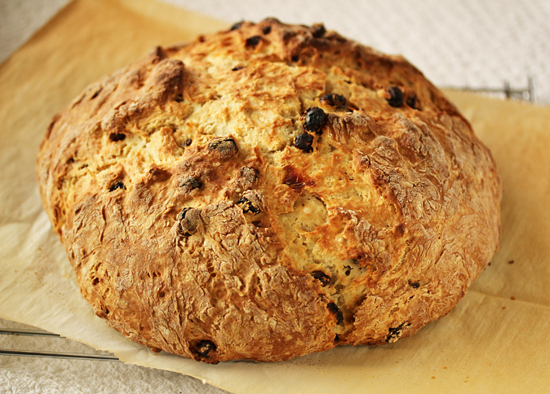 The old authentic recipe for soda bread contains only four ingredients: flour, baking soda, buttermilk and salt. It was a poor peoples’ bread for those without ovens. Bicarbonate of soda or baking soda was introduced to Ireland around the 1840s and was inexpensive to produce, allowing soda bread to be cooked in a cast iron pot with a lid directly on coals or on a griddle over a turf fire. In the northern regions it was formed into a flat disk on a griddle and divided into four triangular shapes called farls. In the southern regions it was baked cake style in a round loaf. The dough for soda bread is extremely soft, and my rendition also contains sugar, butter, raisins and egg, which were added to make it a little richer. 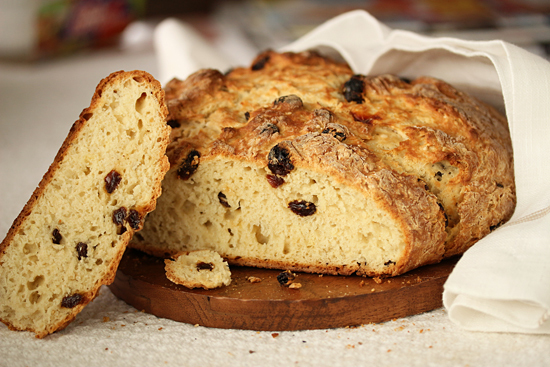 When soda bread contains raisins, it is called Spotted Dog. You can see how pillowy the dough looks. And this is what it looks like when it comes out of the oven. Really beautiful. Traditionally soda bread has an X cut across the top. Scientifically this lets heat into the thickest part of the dough and allows room for the loaf to expand. It may also be the sign of the cross to bless the bread and give thanks. Some say this is superstition, but it may also ward off the devil and protect the household. You never know. This bread is slightly sweet with a lovely soft crumb and that unmistakable goodness of the buttermilk. The crust is crispy at first, but the second day, after sitting wrapped airtight at room temperature, it softens. This was so good right out of the oven, sliced warm and slathered with butter. I hope you have a great St. Patrick’s Day. Don’t forget to check out my Corned Beef and Cabbage post. I’ll drink a green beer for you! 1. Preheat oven to 425 degrees F. Line baking sheet with parchment paper and lightly coat with cooking spray. 2. In a large bowl, whisk together flour, sugar, salt and baking soda. 3. Using a pastry cutter or two knives, cut butter into flour mixture until it resembles course meal. Stir in raisins. 4. Make a well in flour mixture and pour in beaten egg and butter milk. Mix with wooden spoon until all flour is incorporated into buttermilk. 5. Liberally dust work surface with flour. Transfer dough to surface and sprinkle with flour. With flour dusted hands, form dough into a ball that is relatively smooth. 6. Place baking sheet next to dough work surface and place dough ball on sheet. Dough is very soft so use hands to scoop up and surround ball to transfer to sheet. 7. 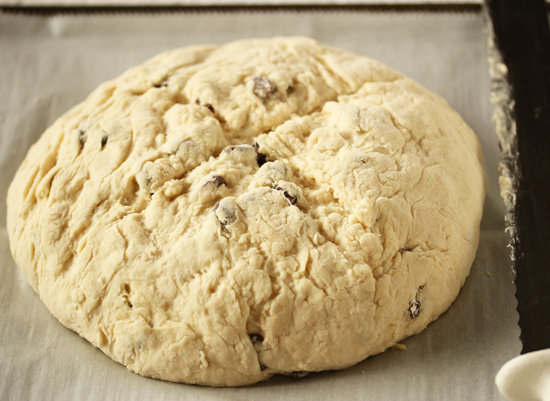 Using a serrated knife, score top of dough with an X shape ½-inch deep. 8. Bake about 40 minutes, until bread is golden and bottom sounds hollow when rapped with a knuckle. 9. Transfer bread to rack to let cool briefly. Slice with a serrated knife and serve bread warm or at room temperature, slathered with butter. Also delicious sliced and toasted. I like this post and I’m going to try the Irish Soda Bread. However, I especially like the recipe for the corned beef with rutabagas! I grew up in the south. We ate and loved rutabagas all the time. I’ve never thought about adding them to corned beef and I thought: Lynne is a genius! I know the flavor will be perfect. Thanks for this epiphany. I enjoy your posts and your blog is one of my favorite. This looks delicious! I going to make both the soda bread and corned beef for supper Saturday. Thanks for posting and the inspiration! 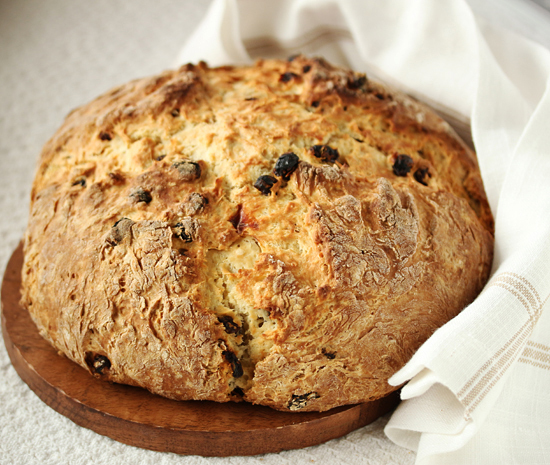 I love the history of Irish soda bread. I didn’t know I what was making all these years was called spotted dog. Thanks for the great information and recipe. This looks so good and is one of my faves! OMG This looks so good. Love it, Lynne. Have to try it tonight! This bread is gorgeous! 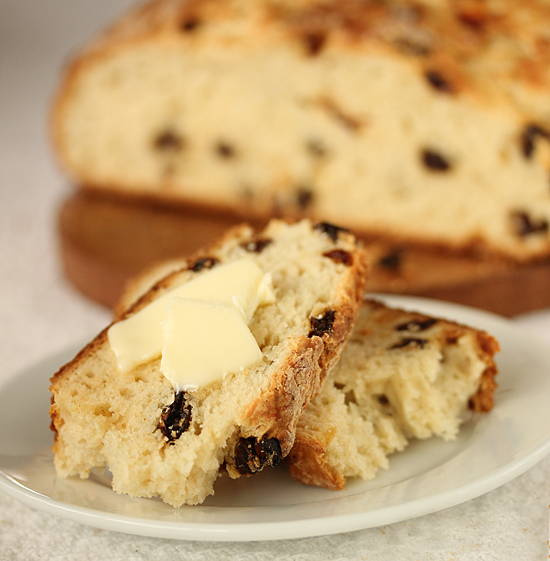 I love Irish soda bread, with some nice thick Irish butter too!